A pre-release screenshot of Mario holding a Spin Drill near some Diggas. Note the further-apart, Bullet Bill-like eyes and untextured metallic rim. 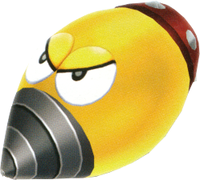 Diggas are enemies resembling drill-fronted Bullet Bill only appearing in Super Mario Galaxy 2; they are located in the Spin-Dig Galaxy. Diggas drill with their body exposed and move in set circular paths along the surface, ignoring Mario. On one rectangular planet, they briefly stop moving along the surface to dig through a wall and come out the other side. They are also launched from the underside the boss Digga-Leg, similar to how its predecessor, Megaleg, launches Bullet Bills out of its. These Diggas burrow all the way through the planet before beginning their typical circular motion. They have a yellow body, a drill for a nose, angry eyes, a brown rim covered in metal studs on the back end, and no arms or legs. They can be easily destroyed by a Jump, a Ground Pound or with a Spin Drill. In a pre-release screenshot, their eyes were further apart and designed much different from the final, furthering the resemblance to Bullet Bills. Horīna Hori is related to the Japanese verb horu which means to dig. This page was last edited on April 25, 2018, at 19:50.